Terry Harpold, Daniel Compère, Volker Dehs (eds.). Collectionner l’extraordinaire, sonder l’ailleurs. Essais sur Jules Verne en hommage à Jean-Michel Margot . Amiens: Encrage Édition, 2015. 350 pp. Note: This review will be published in French in 2017 in the Bulletin de la Société Jules Verne . Sometimes chance leads us down paths that we did not intend to travel, or perhaps we did without realizing it. If, during the Second World War, a good protestant minister  had not welcomed Bernard Frank, if later he had not invited him to give a lecture on Jules Verne in a Swiss village where Jean-Michel Margot lived, if Jean-Michel had not attended, perhaps he would not have bought a biography of Jules Verne and asked its author, Bernard Frank, to sign it for him . And what's next? Probably Jean-Michel would not have been so attracted to Verne and would not have started his incredible collection. And the consequence? Today, one would not be able to profit from the incredible richness of this important documentational trove, gathered in the Espace Jules Verne at the House of Elsewhere (Maison d'Ailleurs) in Yverdon-les-Bains, Switzerland. But what's most important, Jules Verne would not have had one of his most renowned specialists in the person of Jean-Michel Margot. And, finally, if the opening of the Espace Jules Verne had not happened and friends had not gathered in a small symposium with the subsequent collaboration of other specialists, this Festschrift would not exist . Fortunately all these events did materialize over time. Visiting the Espace Jules Verne and working in it is now possible thanks to the immense generosity of Jean-Michel Margot who offered his lifelong collection to the town of Yverdon-les-Bains and its science fiction museum , the House of Elsewhere (Maison d'Ailleurs). During the nineteenth century Jules Verne's works were published in French editions and translated into many languages worldwide. In the 20th century this trend continued with enormous success, and new variations emerged: literary, cartoons, cinematographic, theatrical adaptations, etc. These different versions of his works enabled an even larger population to access Verne and his popularity increased to such an extent that his name became a popular archetype . One might think that the twenty-first century would eventually forget Verne. The reality is very different because his works—novels, short stories, and plays—have been republished in modern editions, films of a more or less acceptable quality have been shot, but above all there are many researchers, collectors, and scholars who have contributed to enhancing the greatness and universality of Jules Verne. This Festschrift itself stands as evidence of it. 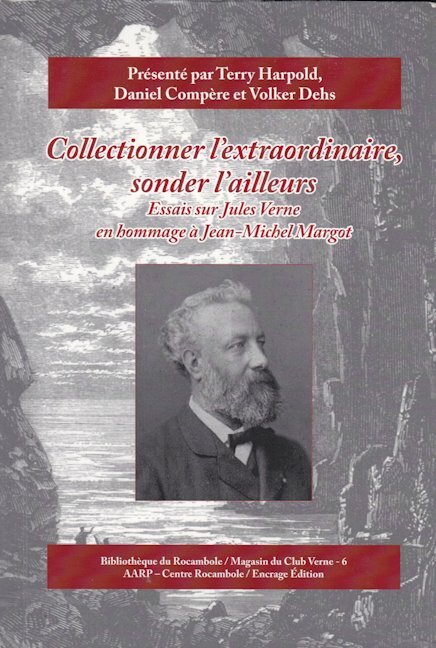 This book, published as a tribute to Jean-Michel Margot, includes six sections in which the authors write about a variety of subjects linked to Jules Verne. The first, Collections, chronicles the history of the Margot collection and its arrival at Yverdon-les-Bains. The second, Text(s) , focuses on Verne's writings and their publication. The third, Images , is dedicated to the illustrations included in the Voyages extraordinaires ( Extraordinary Voyages ). The fourth, Lectures ( Readings ), analyses Verne's writings from a variety of different critical perspectives. In the fifth, Rencontres ( Encounters ), four studies are featured where his geographical backgrounds and characters fuse together with Jules Verne the man. The last part, Voyages , allows the reader to sail along with the novelist. The book ends with a listing of the publications by Jean-Michel Margot and short biographies of the book's collaborators. These twenty four essays explore almost all of the aspects of the life and works of Jules Verne, essays which I shall attempt to summarize in this review objectively and without undue critical commentary. Collections recounts the history of the relationship between Jean-Michel Margot and Jules Verne, and also, the House of Elsewhere (Maison d'Ailleurs). Patrick J. Gyger, head of the museum from 1999 to 2011, writes that when he was young he had the chance to meet Jean-Michel, after which his interest for Jules Verne intensified. He also notes the obstacles that they overcame in order to be able to curate the Margot collection by creating the Espace Jules Verne. Gyger describes the Margot Collection as one that gathers together the novels by Jules Verne, studies of the author and his work, a number of adaptations and offshoots, and a host of foreign language versions. Researchers can therefore find assembled in one place Vernian objects and documents that are essential for the scholarly study of Verne. Gyger emphasizes that it is a one-of-a-kind compilation, unique in the whole world. In his article, the current director of the House of Elsewhere, Marc Atallah, shows us the interior of the museum in order to give us a better understanding of the novelist's works. He explains that, from a literary perspective, Verne exemplifies the interdependence between sociopolitical power and technoscientific know-how. The Espace Jules Verne has to be understood as a place where the memory of our past utopias relate to the future. Atallah writes that this space is to be considered at the same time as a place of remembrance as well as a symbolic one. Finally, Daniel Compère summarizes the importance of this publication in honor of Jean-Michel Margot. He explains how Margot, a Vernian researcher and collector, with limitless generosity and open-mindedness, gave to posterity a collection acquired over the span of a lifetime. With this donation to the Maison d'Ailleurs, Margot allows not only the scholar but also any fan to fully understand Verne and appreciate his œuvre. Text(s) , the second part of the book, begins with a study by Volker Dehs about the different variants of the Vernian text, not from a bibliophilic point of view but from that of a specialist who seeks to establish the definitive version. He makes clear that among the three Hetzel editions—the pre-original (which is the least known), the in-18 edition (which is almost always the original edition found in public libraries), and the famous illustrated red-and-gold grand in-8° edition—the in-18 constitutes an intermediary phase between the pre-original version and the grand in-8°, which had higher print runs than the in-18 format. Dehs, after a methodical examination of these editions, notes that there still remain a number of aspects to verify and problems to solve. Masataka Ishibashi, one of the founders of the Japanese Jules Verne Society, explains how Jules Verne, in writing his novels, incorporates different textual citations drawn from multiple sources. Ishibashi proposes that Verne's creativity can be found in the way he inserts this data into his narratives, combining them harmoniously to create a fictional text. Sometimes, the novelist uses them independently of their original context. To represent this form of writing Ishibashi analyzes in great detail Twenty Thousand Leagues Under the Seas pointing out and explaining the intertextuality of this novel. In the last article of this part, William Butcher thoroughly examines the final eight chapters of the first and second rough drafts of Around the World in Eighty Days , without taking into consideration the specific input from Verne's publisher. He argues that, in each and every version, the goal of the trip can be found in a “woman” and in the objective of becoming the “happiest man of all”. His research shows the need to continue to study and reflect upon the manuscripts so as to better understand the genesis, not only of this individual novel but also of all the Extraordinary Voyages . In so doing we can experience the Verne's true texts, without the intervention of Hetzel, his publisher. Images rounds up the articles that focus on the illustrations. Bernard Krauth, President of the German Jules Verne Club, indicates how he became a Vernian collector and how this led him to study the illustrations in the various Hetzel editions of the Extraordinary Voyages . Krauth identifies the numerous variants of the 5238 illustrations, subject to the commercial needs of the publisher. He mentions as well the “hybrid” editions, rarely the subject of study by Vernian specialists. He concludes with a very detailed list of the illustrations in the works of Jules Verne in the Hetzel in-8° editions and in the pre-originals. Philippe Burgaud takes an interesting detour to investigate different plagiarisms and rewritings in Verne's works. He introduces us to the practices of certain publishing houses who wish to translate Verne's novels and reproduce the original illustrations without having to pay royalties to their publisher, Hetzel. Burgaud raises the question of whether these reproductions constitute a copying, a collage or a simple inspiration that is too faithful. He highlights as well the difficulty in locating the original engravings since for each illustration there may be a number of sources and sometimes these collages are sourced from different novels. The last contribution to this part is by Terry Harpold, professor at the University of Florida. He analyzes the complexity in the reception of the illustrations by the readers. He focuses his research and commentary around a subgroup of illustrations portraying an individual, alone or in company of others, reading. He believes “these images of readers in the act of reading, shown on pages of a book that is itself seen and read” constitute an iconographic reflexivity. Finally, he concludes that there's a real and complex link between us, the readers, and the textual and visual fiction of the author. Readings contains the seven articles that thematically focus on very specific aspects of the Verne's literary production. Garmt de Vries-Uiterweerd, co-founder of the Jules Verne Society of the Netherlands, discusses the role of the cryptogram in The Jaganda . The cryptoanalytic method used in the novel was published two years after the novel itself, which indicates that Jules Verne must have consulted with experts in this field. De Vries-Uiterweerd insists on the importance of being able to study the trajectory of a novel from its birth, from the manuscript to the published edition. Through his painstakingly detailed study, he clarifies the development of the narrative action that the cryptogram imposes in order to solve the enigma in the plot, and which is finally resolved. The following entry is signed by geographer Lionel Dupuy, who speaks of the fascination Jules Verne had for the rocks, minerals and fossils, given his meticulous presentation of them in many of his novels. Dupuy points out the poetical and metaphorical dimensions of the mineralogical and geographical descriptions even though the novelist sometimes errs towards exaggeration in some contexts. This kind of narrative creates an impossible association between mineralogy and geology. He argues that this way of writing allows Verne's readers to discover unknown dimensions of the worlds portrayed in his novels and to offer them something that moves away from the “ordinary depiction of things”. Julia Ramaley Mastro says that in Chairman Island, from A Two Years Vacation , the reader learns the lay of the land through a geographical description. She examines Verne's writing style at the point where the known and the unknown intersect. She explains how the author makes use of the Chairman Island's map to make it visible, and that this “literary” map allows the reader to visualize it. It is only after the boys venture towards the inner parts of the island that the action begins. This gives the reader the opportunity to give shape to this space at the narrative and textual level. Mastro argues that Chairman Island exists only as a construct of language, even though sometimes the author gives free reign to the readers' imagination, in order to share in the narrative's development and the island's creation. Jean-Pierre Picot examines the novel The Tribulations of a Chinaman in China and analyzes it from a cross-disciplinary perspective. He contends that Léon Benett, who created the 47 illustrations, was the first one to offer an adaptation of this Vernian novel, and that his artwork has a documentary quality that often led him to make surprising extrapolations. Then Picot points out that Farrère and Méré's theatrical adaptation with personal addenda (1931) overlooked the modernity of the novel. He argues that the work of these two adapters does have the merit of showing how this novel is one of the more “philosophically scenic” stories of the Extraordinary Voyages . Picot then asserts that the adaptation made by Philippe de Broca and Daniel Boulanger, authors of the 1965 film, does not betray the original and, in fact, it maintains the Vernian spirit of fantasy. Finally, he writes that the benefit of adaptations and tranpositions lies in their being able to generate new creations, as well as allowing each reader to create or recreate the text for themselves. Samuel Sadaune observes that the reading of Verne's novels must be done according to the chronological order of the writing, and not according to the date of publication, in order to see how the Extraordinary Voyages are really a single work divided into multiple volumes. He considers them to be, along other Vernian texts, a kind of ongoing saga in the proliferation of ideas toward which Verne will employ all the narrative voices and forms of discourse available to him. He compares Jules Verne to a prankster librarian who upsets everyone with an, at times, excessive documentation. To support this idea, Sadaune analyzes a novella and two novels, “Mr Ray Sharp and Miss Me-Flat”, North Against South and The Will of an Eccentric . He concludes by saying that Verne's great defining trait is that he does not pick sides and acts according to what suits each story the best. George Slusser and Danièle Chatelain present the first Vernian novel, A Priest in 1839 , an unfinished work which shows the writing style of a young Verne. They scour the novel from start to finish and conclude that the author gets lost in the labyrinth he himself has created. Reading the novel just once is insufficient; it is necessary to go further in order to realize that the dialogue with the Gothic allows Verne to understand that mystery must accompany scientific research. They point out that this novel with all the paraphernalia of a typical Gothic novel can be considered as the starting point of the Extraordinary Voyages . This novel is also where Verne's influences are most notably evident. Laurence Sudret talks about Foundling Mick , a novel in which Verne takes his readers to Ireland and introduces them to the poverty-stricken orphans of that country. Sudret contends that Jules Verne didn't mean to make a realistic or naturalistic novel and that he managed to touch his readers by making use of the extraordinary even when talking about the ordinary. She argues that in this novel Verne, more than a lesson in humanity, seeks to give a lesson about morality to his son, Michel. In her article, Sudret showcases one of Jules Verne's lesser-known novels and invites the reader to rediscover its interesting richness. Rencontres ( Encounters ) gathers four articles of which the first is authored by Arthur B. Evans, North American scholar and Science Fiction Studies editor. He observes that there's a tendency even today to link Jules Verne and science fiction. He discusses the definition(s) of science fiction and points out that, for Verne, fiction is the means to incorporate scientific discourse into literary discourse. Following a meticulous analysis of Verne's, Wells's and Rosny's texts, Evans argues that the main difference between these three authors and their science-based narratives remains a matter of degree, not of nature, and that they belong to the same family. Marie-Hèlene Huet believes that the difficult relationship between Jules Verne, writer, and Pierre-Jules Hetzel, publisher, is built, more than the contracts, upon very diverse connections that criss-cross each other and end up affecting the creation of the Vernian works themselves. The publisher's notebooks and the correspondence between the two individuals provide a good depiction of the clash between two wills: that of the literary creator and that of the book seller, who was also a writer. Huet declares that, in his notebooks, Hetzel reveals his desire to vindicate the works of others, particularly Victor Hugo and Jules Verne. She asserts as well that Hetzel buries himself deeply in children's literature because of his daughter's death, a tragedy that is present in his writings. Philippe Scheinhardt points out the problems that the paradox of circumnavigation posed at the time. He indicates that Jules Verne, in order to write Around the World in Eighty Days , not only makes use of newspapers and available documents as source material, but also carries out a deep intellectual inquiry that pushes him to employ as a subject this transitional meridian. In contrast to Verne’s scientific popularization treatment of the paradox of a day gained/lost, one might also consider the expertise demonstrated by Flammarion on this topic, demonstrated by his speeches published in the newspapers of the period. Back then, to question the transitional meridian between the East and the West and its placement in the planisphere was a hot topic. Verne approaches it with a pragmatic point of view that he uses again in Robur the Conqueror . Finally Scheinhardt explains why Jules Verne introduces Chatham Island in this novel. Timothy Unwin clarifies that Jules Verne searched information in the Le Tour du monde magazine for many of the descriptions in his Extraordinary Voyages . It's the very same magazine in which Désiré Charnay published Six Months in Australia , where he travels to observe and describe the characteristics of said continent with the goal of passing on such experiences as an instructional tool for his contemporaries. It's an idea that Jules Verne also elaborates on in his novels. Unwin thinks Jules Verne acquires the details he uses to write Mistress Branican from Charnay's text, judging by the precise descriptions of the route the heroine takes in the novel across Australia. Voyages , with three essays, is the sixth and last section of this volume in homage to Jean-Michel Margot. In the first, Ariel Pérez, of Cuban origin, recounts the evolution of the publication of Verne’s novels by the publishing houses in South America. It is not until the nineteen-sixties that Cuban editions really spread the Extraordinary Voyages throughout the island. Pérez points out that a big part of Verne's œuvre has yet to be published and that Jules Verne's life still remains a mystery to the Cuban reader. He also writes that these novels are the basis of numerous works by Cuban authors of science fiction. At the end of his article Ariel Pérez attaches a list of the 27 novels published by Gente Nueva . Ian B. Thompson, professor emeritus of geography at the University of Glasgow, gives a detailed description of Jules Verne's cruises onboard the Saint-Michel , as they visit several Channel Islands in the English Channel. He also describes the voyages aboard the Saint-Michel III, listing its many ports of call and makes reference to the places where the steam yacht dropped anchor. Jules Verne had transcribed the tales of his voyages to Jersey on his log book and Thompson fills it in with two magnificent maps with which the reader can imagine this trip. He explains that there is no evidence to support an encounter between Jules Verne and Victor Hugo, who at the time lived at Guernsey. Philippe Valetoux describes the acquisition of Jules Verne's first two ships: the Saint-Michel I and the Saint-Michel II. He adds that the success of the adaptations for theatrical plays allowed Verne to lay the keel of his second boat, ordering a quite larger yacht than the preceding one, which was more of a fishing rowboat. The Saint-Michel II becomes one of the rare French ships built expressly for pleasure boating and on this 13-meter ship Jules Verne undertakes several cruises until 1878. Valetoux retraces the different sales and change of owners until the ship is scrapped in 1911. Fortunately, the blueprints were preserved and the association “La Cale 2 l'île”, after much effort, managed to order the shipyard to rebuild a replica of the Saint-Michel II. Valetoux, who took an active part in this project, finishes his article outlining all the problems they had to overcome to finally reach the glorious day they get to see the Saint-Michel sail down the Loire river towards the sea. The twenty-four articles of this Festschrift show that Jules Verne can be viewed from different perspectives. Jean-Michel Margot and his relationship with the writer constitute the second pillar of this publication. Six interesting thematic sections, heterogeneous, due to the variety of subjects presented, through studies of their lives and their works, give us an exceptional portrait of these two personages. French and English are the languages used by authors of very different nationalities. There are also summaries of each article in these two languages. All this entails much difficulty in terms of editing (the computer is a wonderful tool, but sometimes does diabolical tricks) and small mistakes slipped through as in the Table of Contents where Valetoux becomes Valtoux. “This collection is intended to honor someone who has done so much for the past forty years to advance and accelerate Verne studies. And this is really what these twenty-four authors did with their writings. They represent all other Vernians who want to join this tribute”. As in the novels of Jules Verne or in the notebook of Phileas Fogg, distances or nationalities do not present any obstacle because there is a very special goal to be achieved: to express to Jean-Michel Margot wishes of gratitude from all those who constitute the Vernian world.